Guitarist Alexander Skolnick is known for his heavy metal playing in the platinum-selling band Testament. 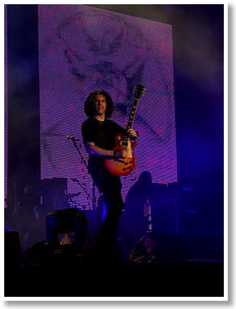 He is also the founder and leader of the jazz group Alex Skolnick. Recently, Skolnick has released a memoir Geek to Guitar Hero based on his early years in San Francisco, California, and offering insights and stories about music and the years he has traveled its roads. G.M. Burns: Writing a book is hard work. What drove you to write it? Alex Skolnick: I've wanted to write for decades and have been working towards this goal for decades. Every time I've come across a book that moved me, I've been more and more inspired to write. It was just a matter of buckling down, sticking with it and devoting myself to the process over these past few years. It was also very therapeutic. I feel a weight has been lifted. Tell us what helped you to sit down and write your book. Over the last few years, I've read Dave Eggers's A Heartbreaking Work of Staggering Genius, Chuck Klosternan's Fargo Rock City and Anthony Bourdaine's Kitchen Confidential." Each of these are memoirs with the qualities of good literature-they tell great stories while focused on specific themes and not becoming full on autobiographies. I was inspired me to do a book like that, but focused on guitar and touring. Did you write everyday and what insights helped you to write it? I wrote everyday or most days. I'd read several inspirational books for artists and writers. One was The Artist's Way by Julia Cameron. Another was The War of Art by Steven Pressfield. Both of those books stressed the importance of showing up everyday and writing, no matter what. Erica Jong's Seducing the Demon was also very helpful, as was the Stephen King book On Writing. I'm in the midst of a tour cycle with my metal band, Testament and planning the next steps for my solo projects. I have an acoustic group, Planetary Coalition, that will be also have social movement and multi-media component attached. We'll be launching a project page via the innovative company Artist Share (a pre-curser to Kickstarter). Then a tour and live album is planned for my jazz trio. I'm also working on this great project with novelist Bradford Morrow which combines his literature with my soundscapes -- it's called The Bestiary. Which new artists are making an impression on you? There are some really great acoustic artists coming around, such as Jake Shimabukuro, the Ukulele player. Also my good friends Rodrigo Y Gabriela, whose album I had the privilege of playing on. And I'm a huge fan of Anushka Shankar, the sitarist, daughter of the late Ravi Shankar. I just discovered her last year and her music is riveting. Tell us what's in your CD player? Anoushka Shankar's The Traveler. I also like Afro-Celt Sound System a lot. When I'm on tour playing heavy metal, I mostly listen to classical piano, Bach, Shostakovich and Schumann. Also a lot of Keith Jarrett. I have absolutely amazing fans. I may not be famous on a mainstream, tabloid level, but am blessed with these loyal, appreciative folks that really get what I do and prefer it that way. I wouldn't trade them for anything.